I recently got to try two amazing products and instantly wanted to share them with everyone before winter comes and steals the moisture from the warmer months. Unless you’re a bahama mama, you’re probably familiar with the chapped skin phenomena. 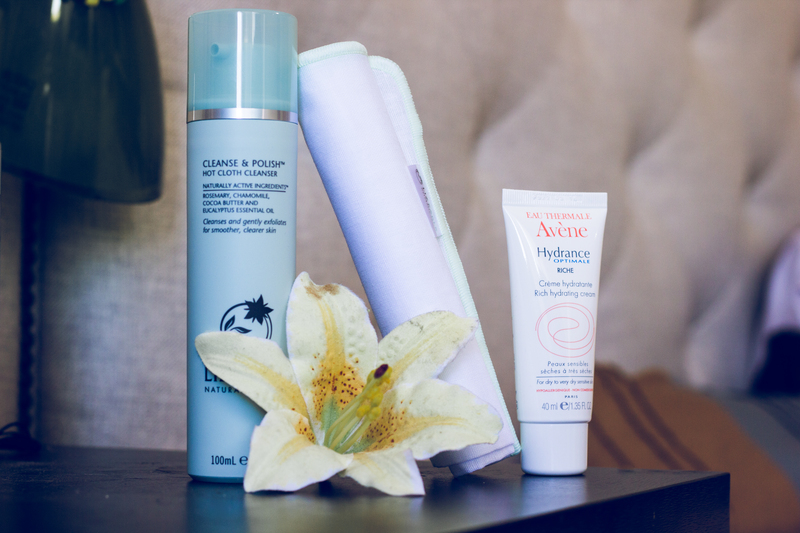 This coming season will be different now that I’ve added two favorites to my essential skin care routine: Liz Earle’s Cleanse & Polish Hot Cloth Cleanser and Avene’s Hydrance Optimale Hydrating Cream. What intrigued me the most about Liz Earle’s cleanser is the unique and detailed way the product moisturizes. They claim to be meant “for all skin types,” but I swear it was created specifically for me! 1. Massage (yeah…it’s like you’re doing a DIY facial!) product onto dry face and neck, outwards first and eyes last. 2. Soak provided muslin cloth in hot water (don’t worry, it almost cools instantly) and wipe off. The muslin cloth acts as a natural exfoliator and removes the heaviest of makeup. I, personally, only use the cloth at night when I’m removing my mask, and it leaves my skin feeling exceptionally smooth and pure (like a baby’s…bottom?). In the morning I also use the cleanser, but without the cloth, since my skin is ultraaa sensitive. In return, it keeps a layer of moisture ready to face a whole day out. What I love about the product as well are the natural ingredients: rosemary (cleanser, skin protectant), chamomile (calming), cocoa butter (mega moisturizer), and eucalyptus (healing). Avene’s moisturizing cream has pretty much become my holy grail. If I could, I would slap this on head to toe (I won’t though…because that’s $$$ haha). They make two kinds: RICHE–for ultra thirsty moisture-deprived people like me, and LIGHT–for people who can get away with not using lotion right after they shower. This company delivers high quality from products to packaging. They use their DEFI system to ensure each product maintains sterility throughout the entire use and carefully select the safest, hypoallergenic ingredients for the most sensitive of skins. I love these two staples so much; I mean, makeup helps to correct and create, but it’s another type of feeling to let my skin breathe every once in awhile! Change the way you wash. Splashing warm water before/during cleansing helps to open up your pores, but sealing it off with a splash of cold water helps to close them. Cool it on the hot water. It’s so tempting to spend long hours in a hot bath or shower during the cold weather, but it actually dehydrates your skin even more. Don’t forget the sunscreen! People think summer = sun, but gloomy days can still do damage. Hydrate hydrate hydrate. Remember to drink at least ~10 glasses of water a day to provide moisture for you entire body. And in the end, your skin will thank you.